Years in development, MICROBE-LIFT Sludge-Away speeds the biological removal of slow-to-degrade organic waste matter from aquatic pond bottoms that may become toxic to fish and plant life. As organic solids accumulate on the pond bottom, they begin to break down releasing toxic gasses to the surrounding environment. These gaseous by-products endanger fish, marine life and plants. 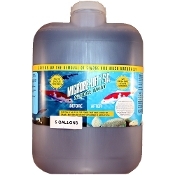 MICROBE-LIFT Sludge-Away removes bottom organic sludge and muck-reducing or eliminating the potential harmful gaseous compounds-and helps clarify your pond water at the same time. 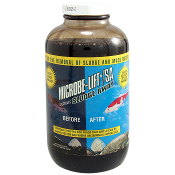 MICROBE-LIFT Sludge-Away may slightly discolor pond water for a short while. Rocks along the edge may darken but will return to their natural color. 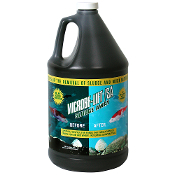 MICROBE-LIFT Sludge-Away will accelerate the solubilization and biological digestion of organic solids in your pond. As a result of this increased oxygen demand, the Oxygen Uptake Rate (OUR) in your pond will increase in the process, along with your aquatic life's need for oxygen.